Michele Quaranta Sensei was born on 24th December 1953. Michele worked as a Bank Clerk and was also a professional footballer with FC Nordstern and then moving onto work as a professionall footbal coach. One of the things that has remained constant with Michele throughout his life is Aikido. 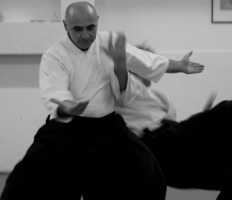 Michele began practicing Aikido in 1972, he has been practicing continually for 38 years now. He was a student and acted as Uke for Masatomi Ikeda Sensei for 20 years. During this period Michele accompanied Ikeda Sensei to pretty much all of his seminars. After the retirement of Ikeda Sensei from Aikido in 2001, Michele Quaranta Sensei continues to teach and spread out Aikido according to the methodology that he inherited from Ikeda Sensei. Michele founded his own dojo in Basel, Switzerland in 1983 (www.aikidoschule-basel.ch). Across Europe there are 3000 Aikido practioners that can count Michele as thier mentor. Michele acts as Technical Director and on various Technical Committees of numerous countries which appreciate his knowledge and expertise. Apart from Aikido Michele also teaches HOJO (a discipline developed at the famous school Kashima Shinden Jikishinkage Ryu which exists from the 14th century. You can attend an Aikido seminar by Michele in any of the following countries Switzerland, Poland, Croatia, Ireland, Slovakia, Czech, Netherlands, Ukraine, Macedonia, Egypt, Serbia, Bulgaria and G. Britain.